He recalls attending reggae jam sessions used to be hosted by supermatch ciggarette co. in disco nights,even tho'was not allowed he ran from home jus to listen to he reggae music en rock where one wud win a packet of cigarrettes. (which he never smoked but traded for a 20 shillings coin) but due to discouragement of music in his mother en lack of support he was forced to do it under... only collecting a daily paper on sunday having an artist profile en lyrics to a song,of which he would use to singalong en practise from such material. ecspedition dad was a music man as he says"my dad when i was 3 to 4 yrs i cud hear him record himself on tapes singing from books en replay again wen he is at home on weekends or playing with us its unclear whether this meant his dad wanted to be a musician, but ecspedition says it makes him believe that that is where he inherited the singing talent ,which also encourages to keep going. 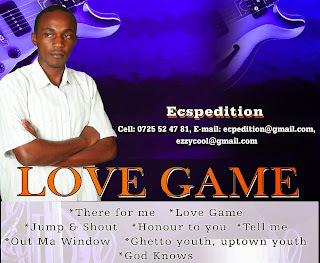 ecspedition never stopped working to his music even after joining high school.but due to unsatisfactory playlists he thot it would be better to deejay these way he would play his own music.He never had any deejay equipments but rather he would record favourite songs on a tape en replay later to his taste. Till later he formed a group which they would only sing en practice on peoples songs comprising a lady en aguy though that lady quit later. "we also parted ways with the guy too with my after high school but in good terms tho my friend would go a head en record his album inmother toungue" ie, Kikuyu gospel which challanged him to find a studio en launch a serious career in music. IT wasnt easy becoz of funds so After form four he concentrated on writing his own songs since most were inspiration and nowhere they were in record for practice or reference.